I'm used to gamers arguing over which title has the best graphics, but which title has the best box art? Not so much. As such, I was intrigued when I came across this discussion on NeoGAF the other day. I can't say I agree with all of the box covers that have been "nominated" in that thread but, hey, to each his (or her) own, right? 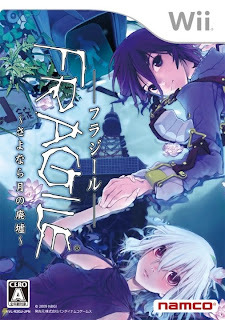 That's the Japanese cover of Namco's Fragile: Farewell Ruins of the Moon, by the way. Xseed is bringing the game to the States in early 2010 (March 16, to be exact--pre-order it here), and thankfully they're leaving the cover image intact (though they are changing the name ever so slightly, to Fragile Dreams: Farewell Ruins of the Moon). Other box covers that impressed me in the past year: 7th Dragon (DS), Dissidia Final Fantasy (PSP), Dragon Age: Origins (PC/PS3/360), Dragon Quest IX (DS), Katamari Forever/Katamari Damacy Tribute (PS3), Muramasa: The Demon Blade (Wii), Persona 3 Portable (PSP) and Sin & Punishment 2 (Wii). Anyway, enough about me. Which box covers caught your attention in 2009? I'm anxious to hear about this Fragile Dreams game when you finally get to play it. I'll definitely be getting Fragile Dreams when it's released in March, Justin, so I'll post impressions ASAP after that. As for Prof. Layton and the Diabolical Box--I agree! I love the art style used in (and on the cover of) the Prof. Layton games. It's just plain charming, honestly. I would love to see a Professor Layton film someday...although knowing the way video games turn out as movies...maybe not. Love the okami cover art for the wii, even better with the card sleeve. As for No More Heroes--I'll have to try it out sometime soon. I passed on it initially, but I'm not sure why. I also passed on Muramasa for some time, but I finally tried it this last weekend and really enjoyed myself. Waiwaitwait...there's an animated movie for Layton out or coming out?! Oooh...excuse me for a minute. Ahem...okay then. That's quite a good surprise. And yes! Live action would be bad...there would be no charm. Maybe I'll have to try Muramasa. Cross your fingers in the hopes that the Layton movie makes it across the pond. I'd certainly see it! As for Muramasa--yes, try it. Rent it if you can, though, since it's probably not for everyone.